Fractal plying seems to be everywhere I look in the spinning world. And for good reason- it’s an interesting way to work with color that adds a bit of spontaneity and surprise to the look of the finished product. I’ve been excitedly waiting for the right moment to spin up the 50/50 Merino Silk top from Corgi Hill Farm, and this seemed to be it. Ben from Schacht Spindle Blog has a wonderful explanation of fractal spinning here. 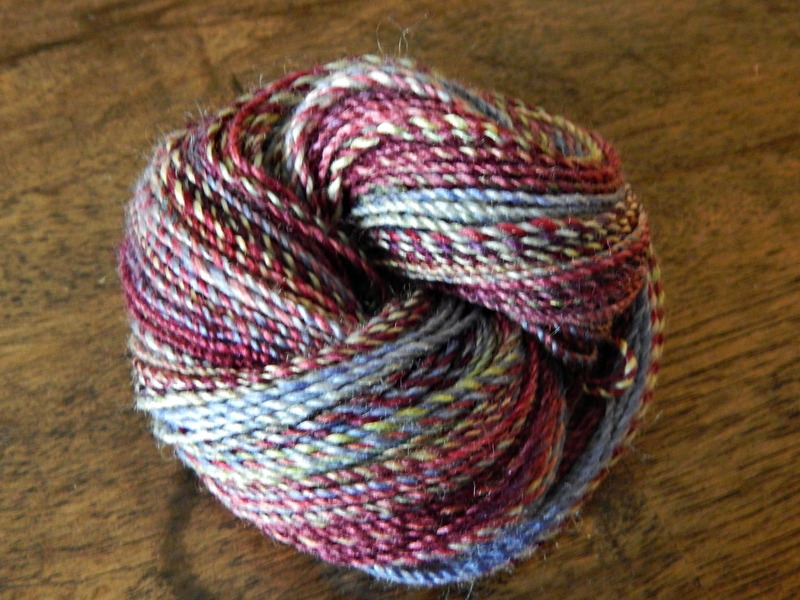 It’s really fairly straightforward for a 2-ply yarn: Take roving, split in half down the middle. Set aside one 1/2 portion, take the other 1/2 portion and split it into quarters. 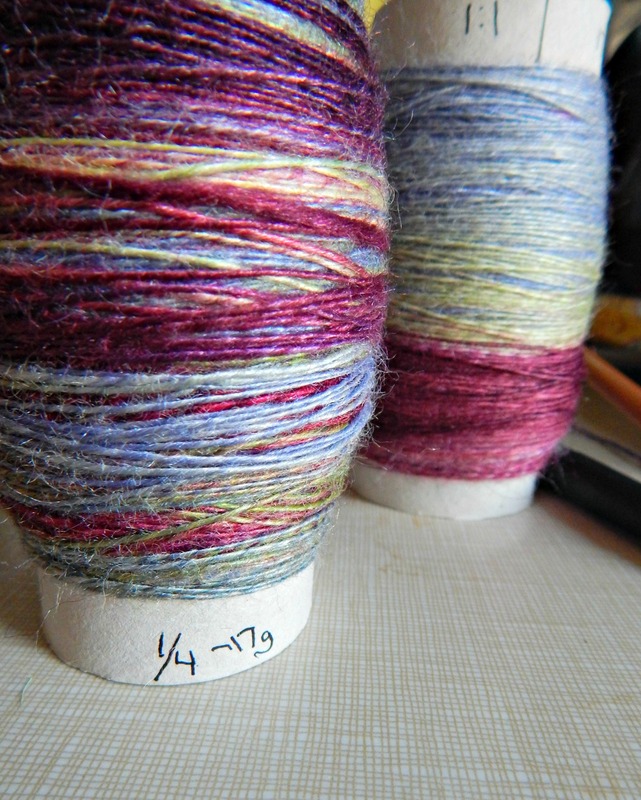 The 1/2 portion gets spun from end to end into a single, creating long color changes. 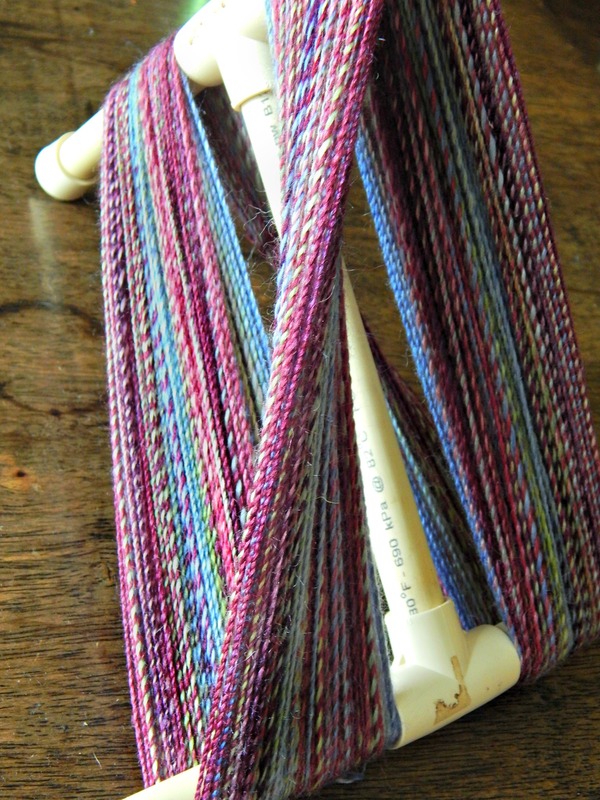 The quarter portions get spun end to end one after another into one long single with four repeats of shorter color changes. See? Barely any math at all! The key to keeping things fractal is always spinning from the same direction. Say one end of your roving is red and one is blue. If you start to spin one portion of roving from the red end, you will also start every other portion of roving from the red end as well. Lovely right? Except I’m working with a drop spindle, which presents unique problems. 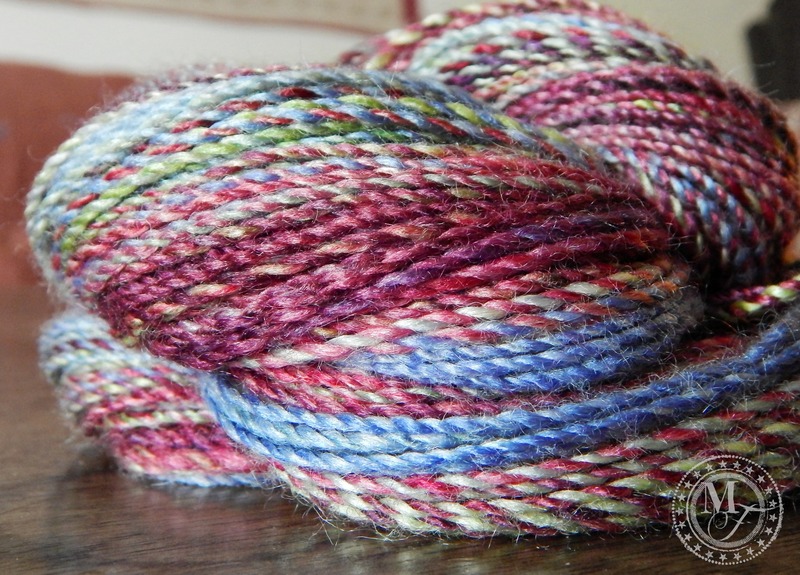 There’s simply no way I am going to fit 2 oz of laceweight single ply on a 5/8 oz drop spindle, which means that my two portions of fiber can’t be spun or plied as uninterrupted singles. Since most descriptions of fractal plying are on spinning wheels, this problem isn’t mentioned much – you load your 1/2 portion onto a bobbin and your 4 1/8 portions onto a different bobbin – easy. Not so with the spindle – 21 g of fiber loaded on was pushing it. The only other reference to fractal plying with a drop spindle I have seen so far is the Spinning for Stripes series of posts from “Mom” at Simply Notable. After some comment-area sleuthing, I discovered that Mom using felted joining on her singles to get around this problem. I am way too uptight and control-freaky for that, plus my attempts at felted joins never seem to hold up (especially not in this case, since my fiber is half silk!). I was going to have to spin separate skeins. My solution? Spin one of my quarter portions from end to end – load onto a toilet paper roll, and weigh it out (subtracting the weight of the cardboard roll). This portion weighed out to 17 grams. The short repeat ply is up front (labeled as 1/4 – 17 g) and the longer repeat is at the back. Take the 1/2 portion (the roving that is half of the original) and weigh out the first 17 grams, taking care to start at the correct end, and separate the length (as you would to grab a piece – not down the middle). Spin up this 17 grams and load it onto a toilet paper roll. Once plied together with the 17 grams of 1/4 portion, this will be Skein #1. 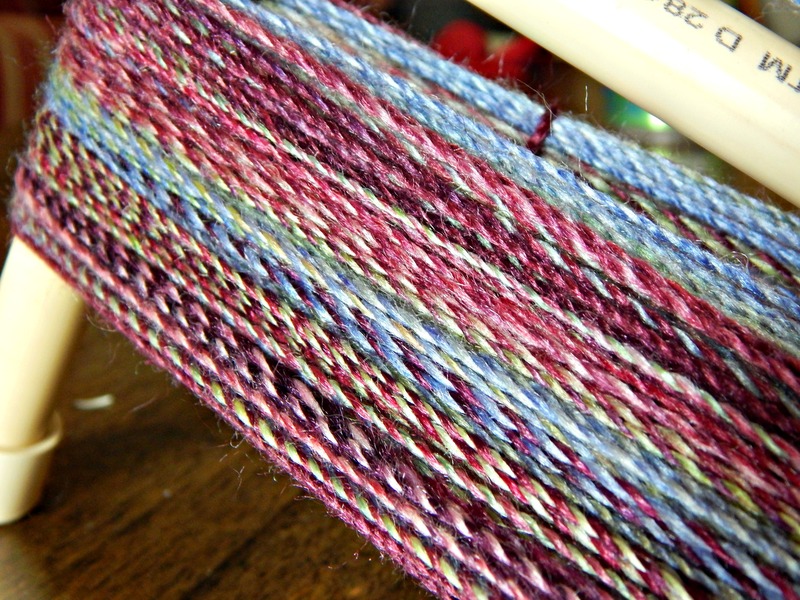 This first part worked awesomely, producing a perfectly matched pair of plies to make into a yarn. The first two singles plied together to form the first skein of fractal yarn. The moment I measured out 21 grams for the next skein, I knew there would be a problem: Due to my imprecise splitting of the roving, my main roving section was not going to measure up to all my 1/4 portions. I was going to have over 10 grams of leftover singles. Disappointing. 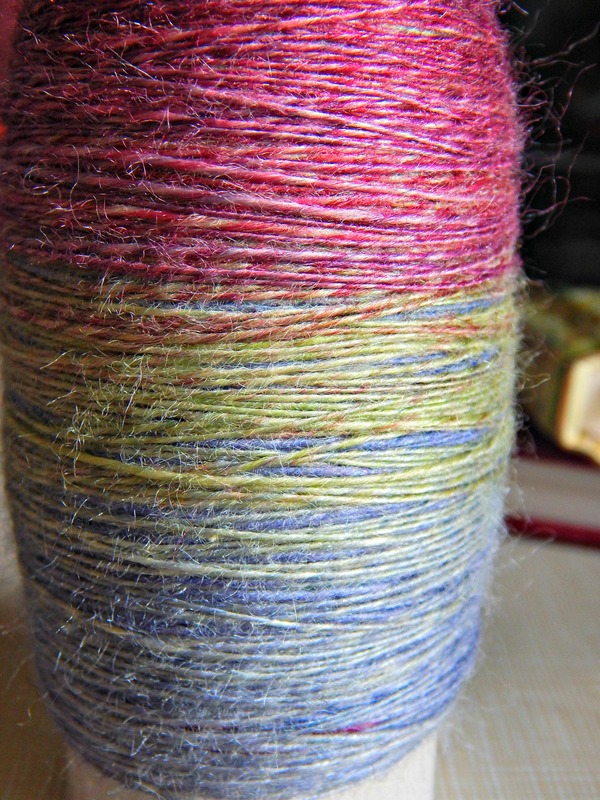 Well, next time I will weigh out my roving as I’m splitting it, and hopefully that will help. As for the leftover singles, I will just ply them differently. Carrying on! The weighing strategy worked well, at least, for making sure my plies were nearly the same length – the yardage for #2 was not perfectly matched like for #1, but it was very close. I couldn’t resist posting pictures, even though I am still currently working on producing skein #3. I did mess around with chain/Navajo plying some of the extra fiber, for comparing and contrasting and such. 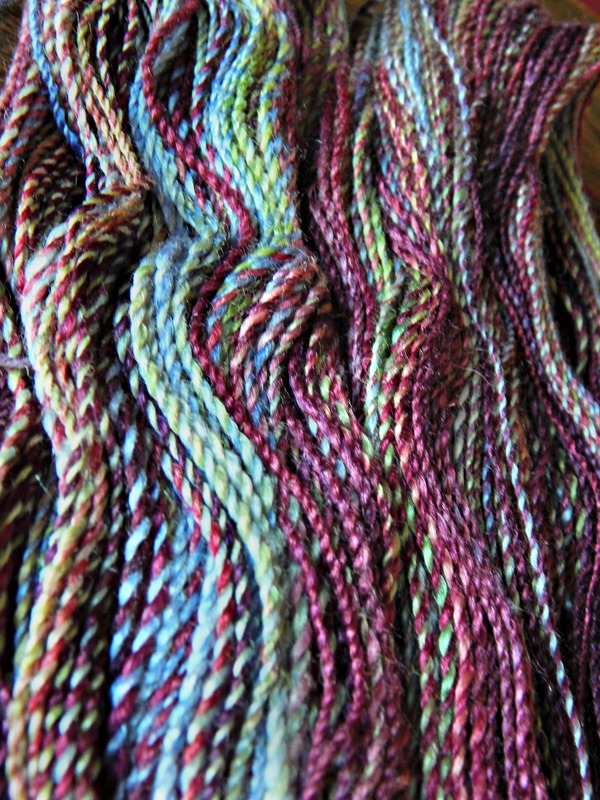 Lastly I’d like to add that since my fiber was dyed in a repeating colorway, it’s not really vital to the look of the future FO that I carefully number my skeins – because each skein has a very similar look. 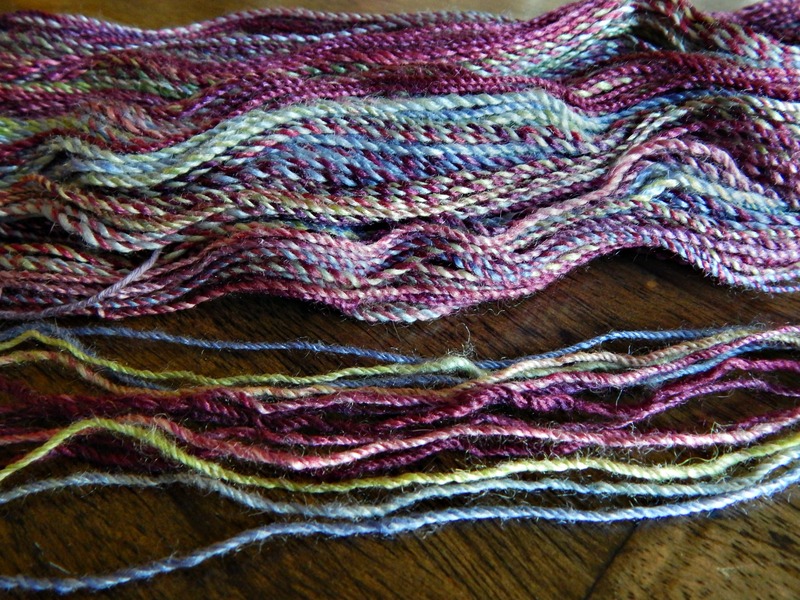 However, were I working with a fiber dyed in a gradient colorway the order in which I worked up my skeins would matter a lot more because each skein would contain a long color repeat ply that was different than the other skeins. Now, more pictures. I dubbed this yarn “Bag of Jewels” because of the gemstone colors and the rich sheen the silk adds to the finished product. I am excited to knit something with it, but the work involved with spinning it in the first place is definitely an accomplishment in its own right! EDIT 9/8/15 – If you’d like a more in-depth look on how to choose rovings for fractal spinning, here’s a great article (as always) from Knitty. EDIT 6/7/16 – I ended up crocheting with this fractal ply yarn, if you’re curious to see how fractal ply measures up to being crocheted, you can see the piece featuring this yarn here. 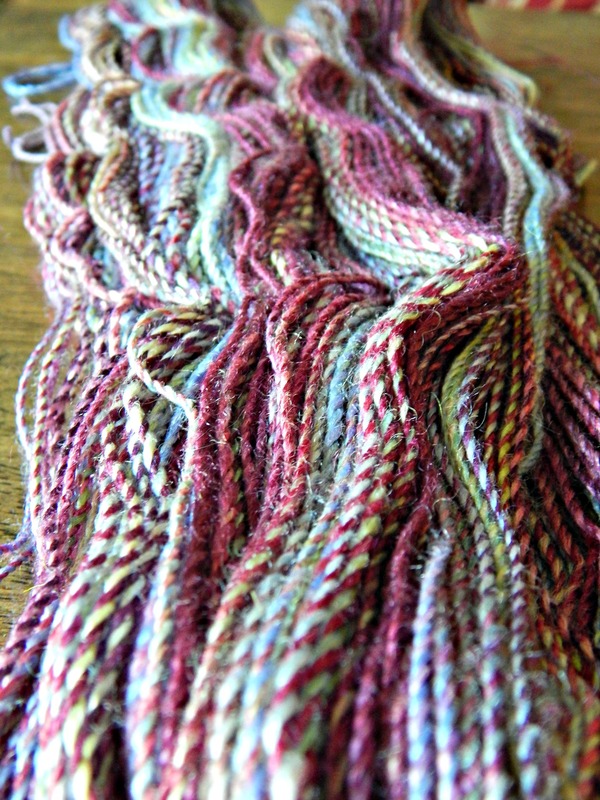 As usual with variegated yarns, crocheted pieces muddle the colors more, but it did turn out lovely all the same. AND I was able to make a knit headband to match. Gorgeous! Thank you for the very clear tutorial, too. Unfortunately I don’t… I’m almost entirely hopeless when it comes to the technical aspects running this website and rely on WordPress to do most of the work for me, lol!